Solo Sushi Bekkan is quite tiny, but the tiny ones are usually the best ones, I find. It’s not a place you would notice walking down Yonge Street, even though it’s only a few doors from Toronto’s main strip. I’m thinking it holds maybe 15 people at the most. I never realized how small it was until I got there. I agree with you though, sometimes these are the hidden gems. I know that I see this place almost everyday as it’s on my walking route to work and been meaning to check it out. When I first arrived, it was pretty much empty. 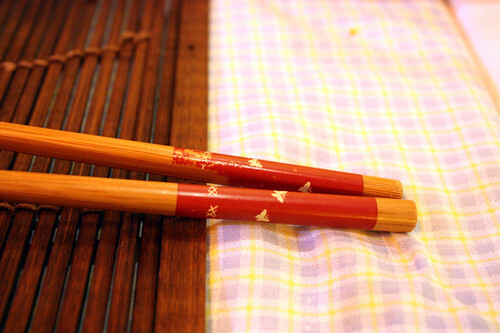 When I was seated I noticed some nice little touches you don’t see at the standard “yet another sushi” restaurants: Cloth napkins and little rock holders for your chopsticks. Indeed… always a good sign. I ordered up a Sapporo while we perused the menu. On the take out menu it says ‘Real Food for Real People’ which seems to me to be very much a non-sushi type saying, but anyway… My Sapporo beer arrived in a Asahi glass – which the waiter even commented on (edit: and the mug was frosted — I love that!). Oh, and I liked how he even placed our cloth napkins for us. I’ve never experienced that at a sushi place before. So far it was all class. You know I actually think the waiter also doubles as the owner/sushi chef… He’s a jack of all trades! As we were there, the place started to fill up. Then again, due to the shear size of the place, adding a few more people will quickly make the place full. Full house = around 16 people. … and that includes that tiny little bar across the one wall. Wild. Ok, to the food itself. Everything was super fresh. It came out in stages (unlike most places we go to). We would finish one dish and then the next would come out. So, if you want variety all at once this isn’t the place. My only real issue was the rice. It seemed to fall apart from the fish quite easily making a total mess of my soy sauce dish. Yes the food was very fresh. You can really tell the difference here. Also I noticed that the sushi was prepared in a more traditional way where there is some wasabi already in between the rice and the fish. I like that. Your right in that the rice was very soft and required a lot of chopstick skills to handle it properly without it breaking into pieces. 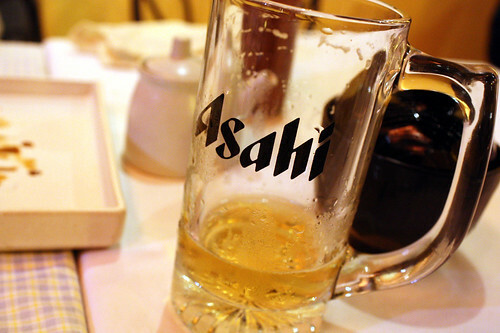 After all the sushi restaurants we’ve reviewed so far, I had higher hopes for your skills. A bit disappointed my friend. The proof is in the soy sauce dish! You’re not kidding. The chef got very heated in that discussion. What I got out of it was that the “All you can eat” sushi idea originally came from Vancouver and he simply hates it. 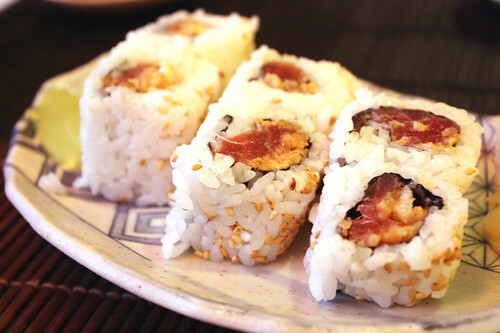 The quality of fish suffers and an overall lack of sushi skill that is required to prepare it. I think he mentioned something about seasonal fish or maybe overpopulation. Not exactly sure but what I do know is he hates the idea with a passion. Ah, ok. Makes sense. 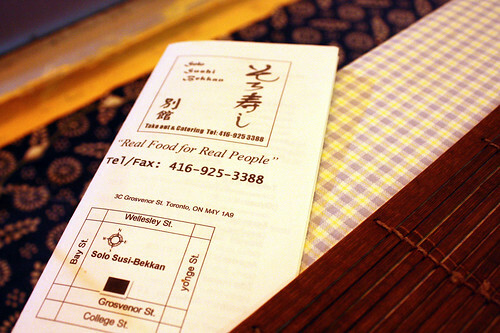 This place is pretty much the opposite of an ‘All You Can Eat’ place anyway (and, yes, that’s a good thing). 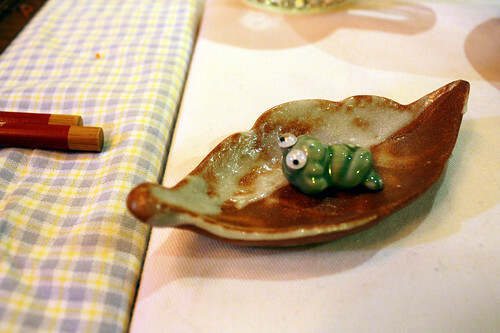 After our last dish we waited for a bit and we were then served complimentary dessert. I didn’t really care for it but it’s free so what the heck. 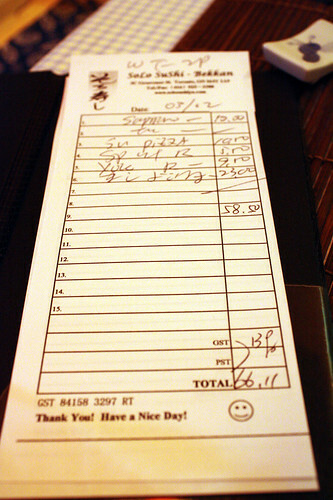 The total bill before tax was $58.50. That includes a $10 beer. Sixty-six and change after tax. I was totally stuffed once it was over. Well you know me and complimentary dessert (instant +0.5 to my rating)….and I don’t count a couple slices of oranges as dessert. Anyways, it was a rice pudding kind of thing and was nice finish to an overall excellent meal. 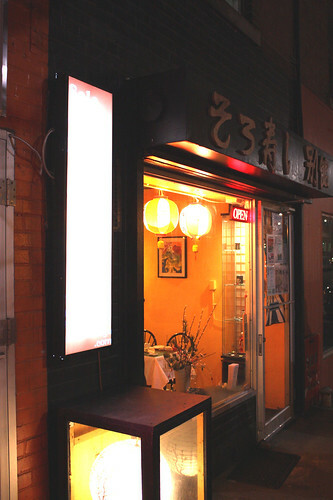 Solo Sushi Bekkan is an easy recommend for me and especially over the other 3 sushi restaurants in the area. 9 / 10. I’ll join you with the nine. 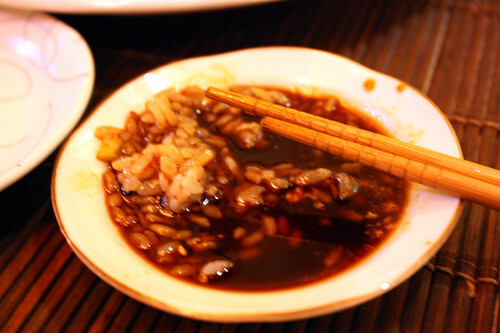 The rice was a bit messy but the freshness and service were impeccable. I also liked how he basically encouraged me to take more photos. 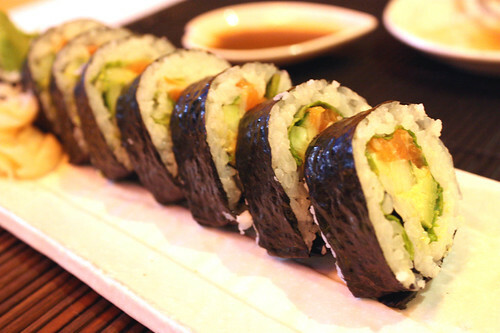 Ditto for his disdain for low-quality sushi! You can tell they really care here – both with the food and the service. 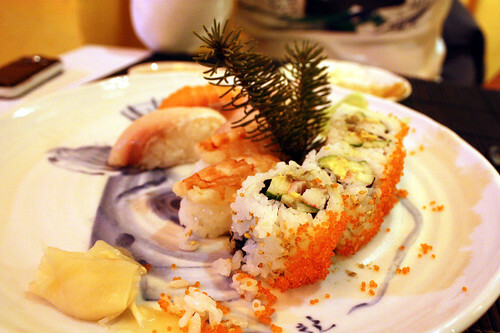 Skip the Yonge Street sushi strip north of College Street and come up a block or two to Grosvenor and Yonge instead. You won’t be disappointed. We went, on the strength of your review, and it was superb. Went back last week and it’s been replaced with a Middle Eastern restaurant. Sad times.